Every word in the Greek New Testament is explained in great detail, covering all context usages for these words. - Publisher A detailed study tool for Bible scholars, this dictionary is the perfect companion to The Complete Word Study New Testament. Each Greek word in the New Testament is defined and explained, providing readers with all they need to explore every idiom and nuance of the original Greek text. Each entry includes word derivation, exegetical commentary, word history and etymology, and synonym and antonym lists. 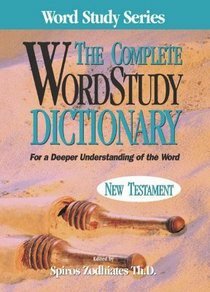 About "The Complete Word Study Dictionary: New Testament"
Author, biblical scholar and businessman Spiros Zodhiates was born in Cyprus in the 1920s. He worked with the American Mission to the Greeks and has helped raise a great deal of money for food and money for Greek children. He has established more than 20 orphanages, and his organisation is active in over fifty countries, including a Bible school in Indonesia and leper colonies in India. He has written or edited more than 50 books and reference works.